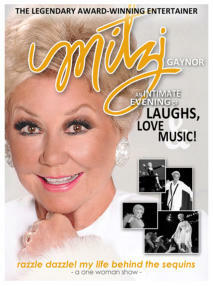 Emmy Award winner and Golden Globe nominee, Mitzi Gaynor, lights up the stage with her acclaimed multimedia musical-comedy memoir Razzle Dazzle! My Life Behind the Sequins . Razzle Dazzle! My Life Behind the Sequins is an intimate evening of laughs, love & music which critics have called “sensational,” “hysterically funny,” “enormously entertaining” and “a total star-spangled package of energy and joy.” In this glittering one woman tourde-force, the star of such blockbuster Hollywood musicals as Les Girls, Anything Goes, There’s No Business Like Show Business and Rodgers & Hammerstein’s South Pacific presents a personal peek into her star-studded life and career through side-splitting stories and intimate reflections interwoven with classic songs, remarkable video montages and breathtaking Bob Mackie costume creations. This unforgettable love letter to a great era of show business features Mitzi’s captivating brand of storytelling, including her hilarious anecdotes regarding some of her famous friends and costars - from Gene Kelly, Ethel Merman, Rossano Brazzi and Marilyn Monroe, to readying herself to meet The Duke of Windsor, her whirlwind romance with Howard Hughes, and the joyous 52 year marriage to the love of her life, Hollywood producer Jack Bean. Use of stunning video footage (culled from Mitzi’s television, concert and film work) and a cavalcade of familiar Hollywood, Broadway and Pop hits further explain and illuminate Mitzi’s story and express her adoration for her audiences. Razzle Dazzle! My Life Behind the Sequins is a once-in-alifetime opportunity to be “up close and personal” with the electrifying magic and incredible spirit of a true entertainment icon.